Important: Abacus currently only supports SAML-based single-sign-on providers. 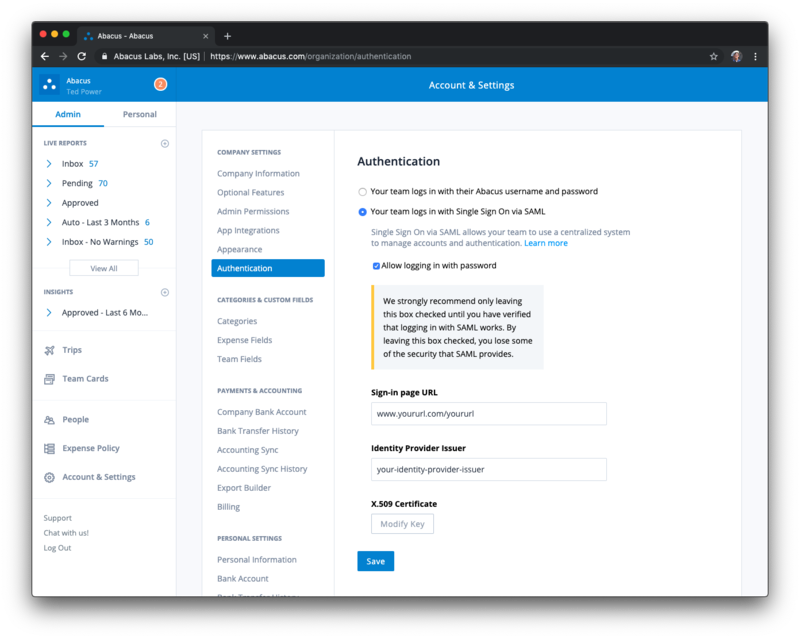 If your company uses an Identity Provider like OneLogin, Okta, JumpCloud, or others, you may want to configure SAML on Abacus. Note: In order to set up SSO, your organization must be on Abacus’ Enterprise plan, and you must be an Admin. Congrats! Now your company is configured for SSO. Note: Once SSO is enabled, this will be the exclusive way you and your team will be able to log in to your Abacus accounts. Any attempts to use a username and password to log in to this Abacus account will return an error. Your employees will be directed through your Identity Provider, and then once they log in there, they will be redirected to your Abacus account. Do you use the ‘Connected Orgs’ feature of Abacus? If so, no problem! Your team will have different organizations in their account, and they will be prompted to authenticate the appropriate ones. When deactivating a user, you will need to deactivate them in Abacus, in addition to disabling them in your Identity Provider. This ensures that their access to the mobile apps, as well as the web, will be deactivated.